All CKC test facilities are accredited to ISO Guide 17025 by A2LA. Click here for a listing of all CKC accreditations and agency listings. 20 ton capacity, 40 ft. diameter turntable and extra large entry door, makes Site A ideal site for testing large, heavy and/or complex systems. 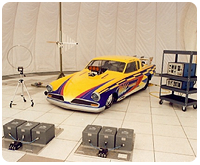 The low ambient environment provides the same fast, accurate and repeatable reading as our smaller test sites. 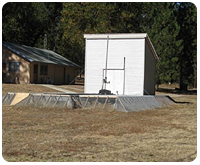 Test Site Information. Accreditations. Get Help Now. Mariposa Site C is a semi-anechoic chamber. This site is optimally configured for and is configured for compliance testing to CE and IEC immunity requirements. The chamber is equipped with an attached isolation room for EUT support equipment. Mariposa Site D is an Open Area Test Site (OATS). 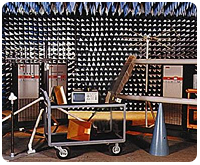 The primary focus of Site D is RF emissions and transmitter performance testing for FCC, IC, CE mark (EN), VCCI and CISPR. The low ambient environment of Site D makes it ideal for providing fast, accurate readings in a convenient, low ambient environment. ©2019 CKC Laboratories, Inc. All rights reserved.